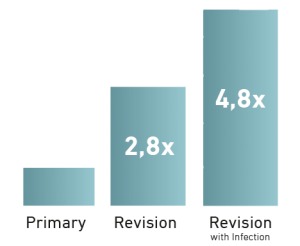 A study conducted at the University of California, San Francisco on the subject of revisions came to the conclusion that the costs for a surgical revision (repeat surgery) are almost three times as high as the average costs for the initial surgery. If a revision is required in connection with an infection, the costs are almost five times as high as for the initial surgery. External fixators stabilise injured bones. These devices are fixed to the bone through the skin from outside the body. Accordingly, the rates of infections in this field are particularly high – experts estimate around 10-20 per cent. In addition, the risk of complicated treatments or an amputation increases enormously in the case of infection with multi-resistant bacteria. In the case of fixators in particular, the advantage of the antimicrobial coating with HyProtect™ is outstanding. A pin coated with HyProtect™ prevents bacteria on the pin outside the body from migrating into the body. In this way HyProtect™ contributes to reducing the risk of infection. Implants such as endoprostheses are perceived as foreign entities by the human body. Already in the 1950s, it was successfully demonstrated that bacteria adhering to a foreign body are considerably (by a factor of 1,000) more infectious than unbound swimming bacteria. The HyProtect™ technology is used to reduce the quantity of bacteria on implants. HyProtect™ decreases the number of bacteria which can trigger infections. Today, hernia meshes are an indispensable aid in surgery. They are introduced as permanent implants following umbilical and inguinal hernias. Around 1.5 million hernia operations are performed every year, of which 300,000 are carried out in Germany. The HyProtect™ technology provides additional safety, so patients can recover quickly and with a reduced risk of any complications. We would be pleased to create/develop an individual solution together with you on request.